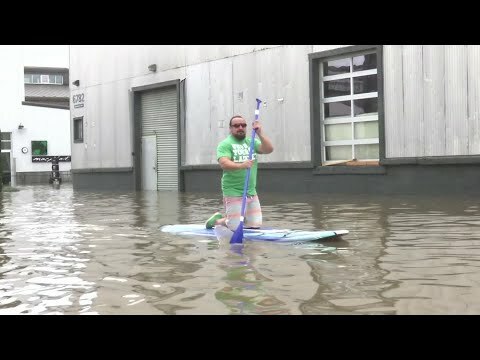 GUERNEVILLE, Calif. (AP) — A Northern California river flooded 2,000 homes, businesses and other buildings and left two communities virtual islands after days of stormy weather, officials said Wednesday. The towns of Guerneville and Monte Rio were hardest hit by water pouring from the Russian River, which topped 46 feet (13 meters) late Wednesday night, said Briana Khan, a Sonoma County spokeswoman. The river frequently floods in rainy weather but it hadn’t reached that level for 25 years and wasn’t expected to recede again until late Thursday night. About 3,500 people in two dozen communities along the river remained under evacuation orders. Jeff Bridges didn’t leave even though he said the water was 8 feet (2.44 meters) deep in some places. The co-owner of the R3 Hotel in Guerneville, said he and others who stayed behind were well-prepared to ride out the storm. He and employees moved computers, business records and furniture to second-floor room. Several areas in California set record-high rainfall totals in recent days, including nearby Santa Rosa, which had nearly 8 inches (20 centimeters) of rain in one day. The often-waterlogged Venado weather station 5 miles (8 kilometers) from Guerneville recorded more than 20 inches (50 centimeters) of rain in 48 hours. Elsewhere in Northern California, dozens of people had to be rescued from cars stranded while motorists tried to drive through flooded roads. Nina Sheehan, who is visiting from North Carolina, had to abandon her rental SUV after it got stuck in a flooded hotel parking lot.